from the small piazza of Lamole in Chianti, Italy, or the terrace of the Ristoro di Lamole. 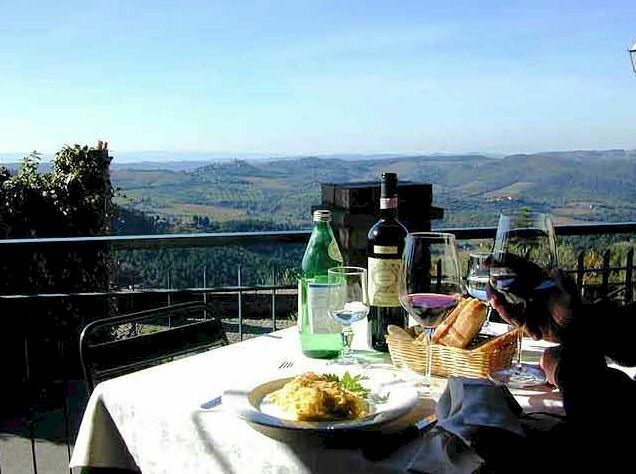 Click here for vacation rentals in traditional Tuscan farm houses near Lamole. 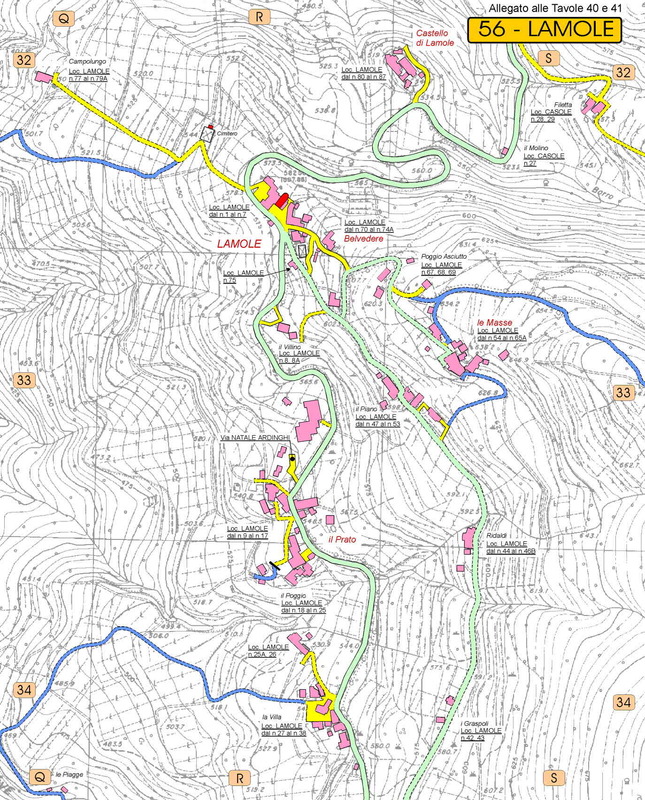 Click for a map of Lamole and the Chianti zone. Detailed map. Musical events are held in the Church during the summer, and the famous Chianti Classico wine Lamole di Lamole is still good. Lamole is a tiny village in Chianti with a restaurant, a small grocery shop and a church. It is famous for its spectacular views and cool summer breezes. The road leading up to Lamole from the turn-off between Greve and Panzano is itself an attraction. Lined in parts with cypresses, it passes villages, precipitous drops and an ancient water fountain. The origin of the name Lamole is unclear. It might come from the words “la mole” (mass, bulk), a reference to the outcrop of rock on which the Castle of Lamole is built or even to the castle itself, or from the ancient word “lama”, plural “lame”, meaning a stony basin from which several streams converge, in this case forming the source of the river Greve. The present village of Lamole is situated at about 600 metres above sea level, half a kilometer past the Castle of Lamole, overlooking the valley from which the river Greve arises. It is surrounded by chestnut and oak woods, and with a view of the vineyards lower down in the valley and a spectacular view of the ranges of hills to the west. The little Romanesque Church of San Donato (13 C) was rebuilt in the 19 C, and in addition to mass, weekly concerts of classical music are performed there from July through September. During the mediaeval period, Greve in Chianti was simply a “mercatale” (market place), existing purely by virtue of its position on a flat part of the Greve valley floor at an intersection of the roads joining Florence and Sienna with the road to the Valdarno. It was a convenient meeting point for the inhabitants of the castles and the numerous fortified villages of the surrounding hills, but without military value itself. It was and is hotter and damper than the settlements in the hills, a significant health hazard in former times. The people of Montefioralle, Panzano in Chianti and Lamole bought and sold in the three-cornered "square" which even today is the main piazza of Greve. 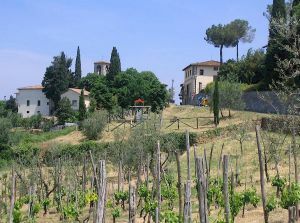 Panzano perches within view of Lamole on a ridge between the Greve valley and the Pesa valley. The ancient core of Panzano is at the same height above sea level as Lamole. There are traces of Roman paving there and parts of the keep and towers of Panzano castle, which was built during the same period as the Castle of Lamole, are incorporated into the church and surrounding habitations. The two castles share some mediaeval architectural elements, and there are paved tracks through the woods joining Lamole, Panzano and Greve. 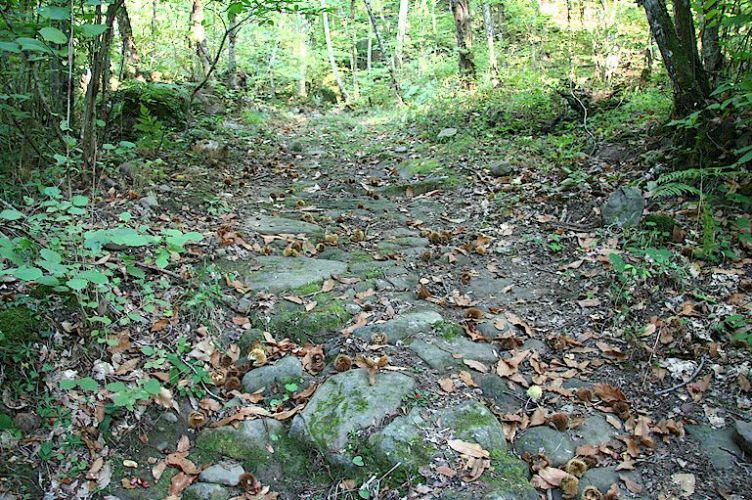 These are often referred to locally as "Roman roads", and indeed some might be of Roman origin, but the paving is mediaeval. 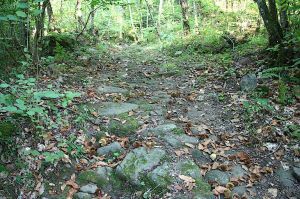 One such track, illustrated here, was in use until the modern road was constructed at the end of the 19 C and is still easily passable from Lamole castle until at least the point where it crosses the modern road. As recently as the 1950s, religious processions passed once a year along another path from Lamole, past Vignamaggio down into the valley and then up to Panzano. Advertise here and see results now! Would you like to advertise your activity on this web site and receive incoming traffic from our network of more than 50 related portals? Click here for details of our integrated solution for a successful internet presence.